Juniper, Juniperus communis, is an attractive landscaping plant, suiting high altitude or desert gardens. The ripe berries, or cones, are traditionally used to flavour gin, beer and schnapps. The berries are also used to flavour meats, pates, pickles, marinades, sauerkraut and potatoes. Fresh and dried leaves used to flavour fish. Aids digestion. Male and female trees need to be planted close to each other for berry set. Juniper is indigenous to the Northern hemisphere. Prefers acid, sandy soils in a open, sunny position. Male flowers are yellow, female flowers are green appearing in spring. Drought and frost resistant. 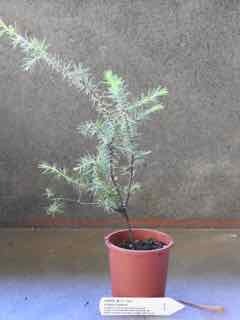 A perennial, evergreen conifer growing to 3m x 2m. Be the first to review “Juniper, plant sexed pair” Click here to cancel reply.